OXON HILL, Md. -- Karthik Nemmani didn't win his regional spelling bee. He didn't even win his county spelling bee. But he was still good enough to win the Scripps National Spelling Bee. Throwing everything he had into his one shot at glory, 14-year-old Karthik outlasted better-known spellers and became the champion after a dramatically abrupt end to the competition, when 12-year-old Naysa Modi misspelled the word "Bewusstseinslage" in the first championship round. Karthik had to spell two words correctly to seal the title, which he did with ease, and the lanky, soft-spoken Texan stepped back and smiled as he was showered with confetti. His winning word was "koinonia," which means Christian fellowship or communion. Karthik is from McKinney, Texas, and Naysa lives in Frisco, Texas - both suburbs of Dallas - and Naysa topped Karthik at their county bee. "She's a really, really good speller. She deserved the trophy as much as I did," Karthik said. "I got lucky." He said there were eight or nine words during the prime-time finals he didn't know - a rare admission for a Scripps champion. In the past, losing at the county level would have made Karthik ineligible for the national competition, but he got in through a wild-card program that was instituted this year. The third-place finisher, 11-year-old Abhijay Kodali, came in second to Naysa at the Dallas regional bee, one of just a few regions that sends multiple spellers to nationals. 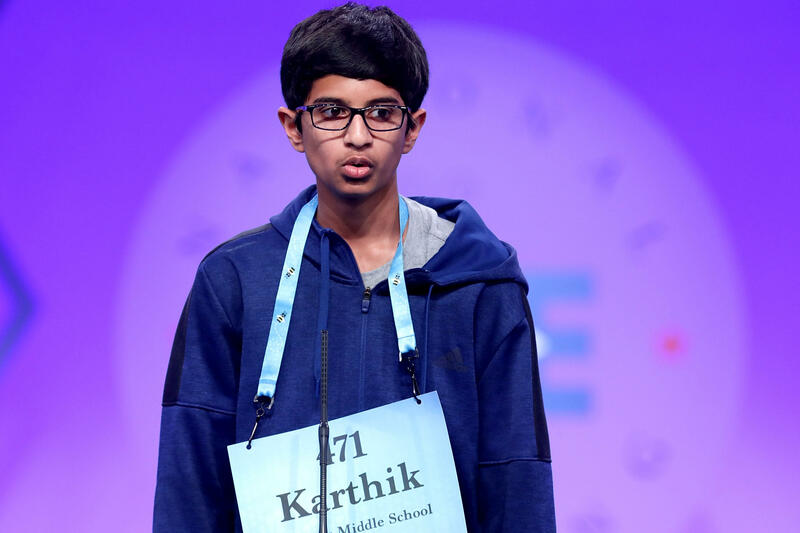 Dallas has long been one of the most competitive regions in the country, and the lack of opportunity for spellers as talented as Karthik is what led Scripps to create the wild-card program in the first place. Karthik is the 14th consecutive Indian-American champion, and 19 of the past 23 winners have had Indian heritage. In addition to the trophy, he gets more than $40,000 in cash and prizes.